It is trite but true, that those how fail to learn from the mistakes of the past are doomed to repeat them. This is why we study history: to find clues as to what will or likely will not work in the future. It is therefore disconcerting that President Obama, as he prepares to wage war against the Islamic State seems bent on repeating the two worst mistakes made by President Lyndon Johnson in his conduct of the Vietnam War. Wars need to be waged to win, or not be engaged in at all. When a President wills the outcome, he must will the means. Which is to say, if he want to defeat an enemy he must give his generals the tools and the latitude to get the job done. However, too often civilian leaders fail in this simple recipe, and keep their military leaders on too-short a leash to accomplish the task. The impulse for civilian political leaders to keep a tight-rein on their military is a common one; in war and in peace. In a democracy like ours, it is critical that the military subordinate itself to the President and their civilian leaders. The alternative is what is seen in many developing countries, where the military officer corps feels responsible to “oversee” the political leadership; removing those they deem unfit to lead. This impulse in war, however, must be tempered with humility: the President must know what he doesn’t know; and be willing to admit that when it comes to war, despite being the “Commander-in-Chief”, he is a dilettante at best. In our history, the best “War Presidents” trusted their generals and allowed them to conduct the war. When they found themselves saddled with commanders they couldn’t work with or didn’t trust (Lincoln with McClellan, Truman with MacArthur) they fired those generals and chose ones they could work with. What they didn’t do is to try and run the war from the White House themselves. That negative impulse must be resisted; for history has shown that it will lead to defeat and even disaster. At the heart of this negative impulse to micromanage ones commanders during a war is often a distrust for the military in general, or the officer corps in particular. The most striking example of this was Hitler directing the German war effort in WW-II from his bunker. Having served as a corporal in WW-I, he had developed a deep and abiding dislike and distrust for the German “Junker” class that made-up the bulk of the German General Staff. As the war rolled-on Hitler took more and more direct control of his war machine; ignoring, over-ruling, and removing any general who tried to reason with him. By the mid-war he was directing company-level operations of infantry units in the Caucuses from his bunker in East Prussia, three thousand miles away; moving pins around a map and transmitting orders by radio to lieutenants and sergeant in the field. This, of course, led to utter disaster; and most experts agree that Germany’s greatest mistakes were bi-products of Hitler’s interference of his general’s running the war effort. Allowing the enemy “sanctuaries” where we refrained from attacking them in neighboring countries (Laos and Cambodia). And..
President Johnson micromanaging the war from the basement of the White House; in particular personally selecting and/signing off on strategic air targets. 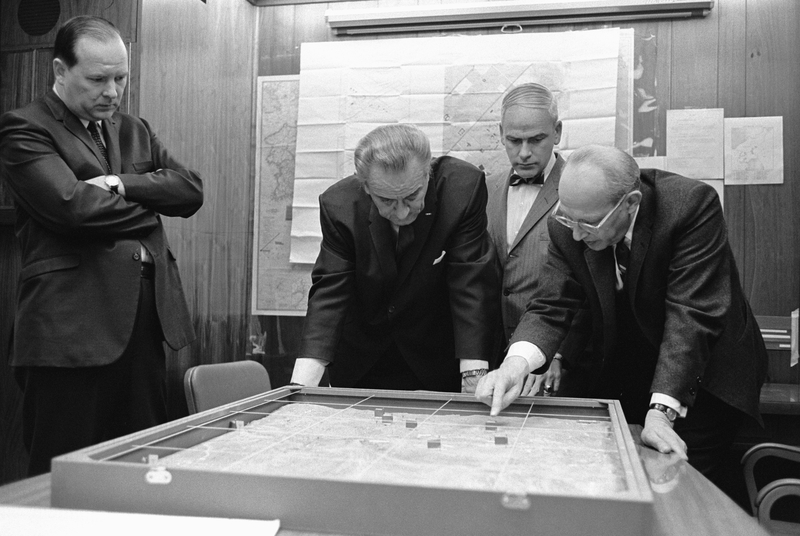 Like Hitler in his bunker, President Lyndon Baines Johnson often micro-managed the Vietnam War from the basemen of the White House; moving pins on a map and demanding targets be okayed by him before commanders on the other side of the globe could execute an attack. Like Hitler, L.B.J. didn’t really trust his generals, and by keeping too tight a control prevented them from doing what was needed to win. So when it is reported that President Obama “Plans to Tightly Control Air Strikes” in this war against ISIS he is preparing to undertake, I see shades of Vietnam all over again. Effective air strikes against viable targets require real-time intelligence; and timely execution once that target is identified. Such intelligence has a very short shelf-life: targets don’t just stay-put in one place and wait to be shot at. In war, the enemy is moving and operating against our forces, just as we are against him. Especially when we are talking about close-air support of ground forces, every minute counts. To expect commanders (or American advisors embedded with allied local forces) on the ground during a shooting war to wait for a green-light from this White House is a plan filled with fail. This is an Administration and a President noted for their excessively slow decision-making processes. “Deliberative” is the best face one can put on Obama’s seeming inability to make timely decisions. In the 13 hours those Operators were under siege in their Benghazi compound by Islamic militants in 2012, no decision to send in support or rescue was made by the President or his National Security team. Instead, the President went to bed; then flew off the next morning to a fund-raiser in Las Vegas. Can you imagine yourself an Operator in Iraq or Syria, embedded with the Free Syrian Army or the Kurdish Peshmerga; pinned down by intense enemy fire and waiting on an air strike that has to be “okayed” by the White House? I can, and it’s not a pleasant or comforting scenario. 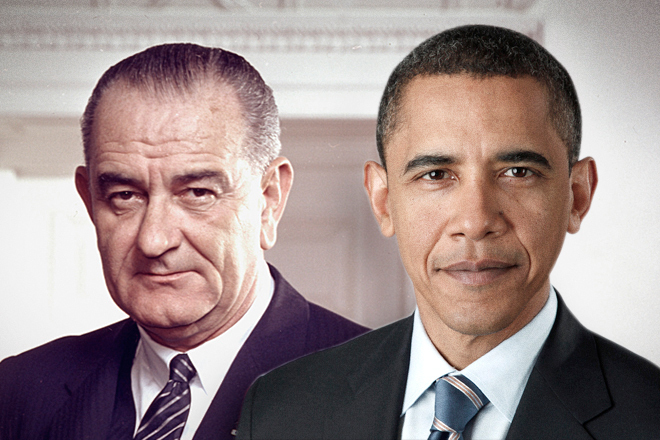 The other LBJ mistake Obama seems to be poised to repeat is to allow ISIS a sanctuary in Syria. Yes, he has floated the idea of air-strikes in Syria. But at the same time, his spokesperson is discounting the idea of crossing the now erased border between Syria and Iraq when it comes to ground conflict against ISIS. To defeat the Islamic State will take a ground-air campaign as large as the Surge that crushed Al Qaeda in Iraq in 2007. To drive them out of the towns and cities that they have captured takes ground forces supported by air assets. 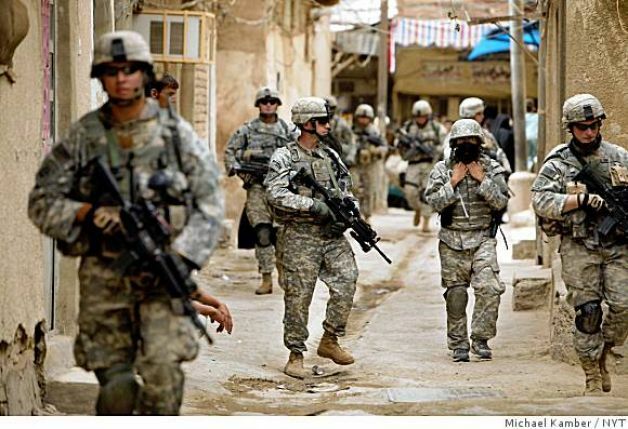 It took 10,000 Marines, supported by artillery and another 3,000 other troops to capture Fallujah in 2004 from Al Qaeda; and the enemy then had only light weapons. ISIS fighters now have a full arsenal of capture American heavy weapons, including tanks. Does anyone imagine that they can be driven out of these same towns with anything less than the forces available in 2004? So in willing the outcome, President Obama (who, like LBJ, distrusts the military and his Generals) is not willing anything approximating the means; and he is placing a leash upon our commanders, leading back to the basement of the White House, that will ultimately strangle both them and any chance of victory. PLEASE CHECK-OUT MY OTHER BLOG!